While Apple and Microsoft saw their share of laptops sold to businesses and other organizations in the U.S. decrease in 2013, Google dramatically increased its portion of sales…With that increase in sales, Google’s Chromebooks accounted for 21% of laptops sold in the U.S. during that period, “up from negligible share in the prior year,” according to the report. I tried valiantly to use the Samsung as my main machine, but by the end of a week, I was about ready to toss it like a Frisbee. As mentioned above by the LA Times reviewer, in 2011 Chromebooks were priced at $500, practically equivalent to the price of a low-end PC laptop. This pricing strategy didn’t make sense given the value of Chromebooks was lower than even what the low end of a Windows laptop offered simply because of the full MS Office functionality and availability of all standard applications such as iTunes. However, at some point in 2012 or 2013 Chromebook manufacturers honed in on the value justified price of Chromebooks and found a sweet spot of between $200-300. It’s hard to find a new PC laptop, even on the low-end, in this price range. At this price, home use consumers justified the trade off of losing full MS Office and bought the Chromebook. Meanwhile, traditional PC laptops continued their march toward better features by upgrading to Intel’s latest battery sipping Haswell processors and transitioning from disc drives (HDD) to solid state hard drives (SSD). This scenario illustrates yet another textbook example of disruptive innovation. 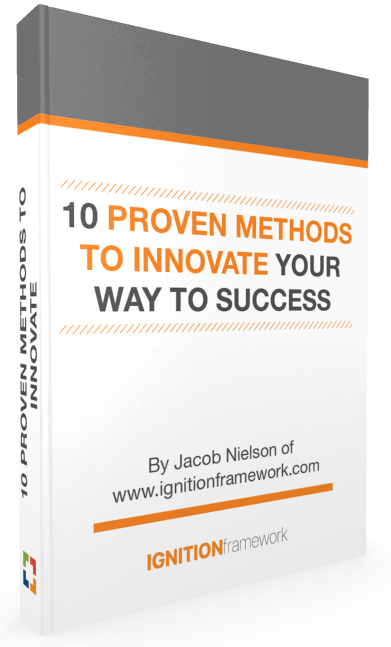 Upon launching this blog, one of the first post’s I wrote was titled “What Everyone Should Know About Disruptive Innovation.” The goal of the post was to explain the concept in terms of the framework that Clayton Christensen originally espoused. 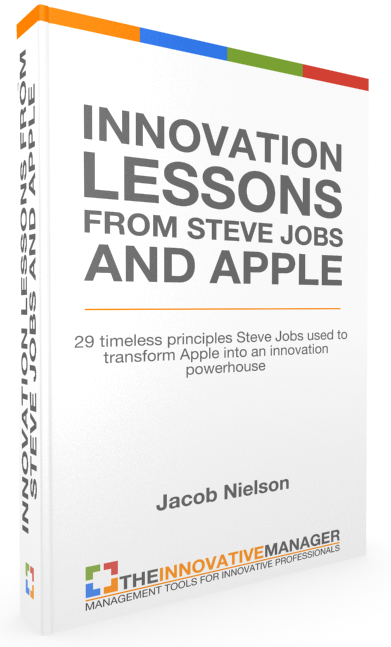 His point was that there was a pattern to innovation and that it followed a repeatable set of circumstances. I won’t repeat the theory here but will further expand on how Chromebooks fit this model to a T.
Light Home Users: people like my parents and my grandparents who do very little with the computer except to check email and Facebook in order to keep up with their kids’ lives. Average Home Users: these people can be any age but they use the computer regularly – mostly for email, Facebook, online news, etc. but occasionally they have a need to create a budget on an Excel spreadsheet or write up a Word document. College/Office/Work Users: these are working professionals who rely on their computer every day. They don’t need it to do massive calculations or to have Terabytes of memory but they do need the computer to perform all MS Office tasks well because they typically rely on these programs every day. Gamers, Designers and Producers: these are the most sophisticated group of the bunch because they constantly push the computing hardware to their maximum limits. All PC laptop specs usually must be top of the line in order to meet their needs. As mentioned earlier in the review above, in 2011 the Samsung Series 5 Chromebook had a number of problems. First was the $500 price tag which was not justified relative to the value it provided. Second was the Chromebook’s paltry capabilities – few apps, no desktop and difficulty setting up printers were just a few of the issues. Even if it were priced at $200, it’s questionable it would have been a success. 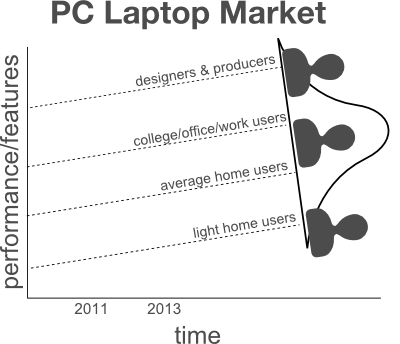 PC laptops however were doing relatively well, especially in a new category called “Ultrabooks” which were lightweight and powerful laptops with long battery life but without a CD disk drive included. These machines caught on well with the college students and travelling professionals who needed high performance, lightweight and a long battery life. Fast forward to 2013 and we see the Chromebooks with lower prices, better performance, more applications and printers that come with Google Cloud Print capabilities. In addition Ultrabooks continue to get faster, lighter and with higher battery life than ever before. 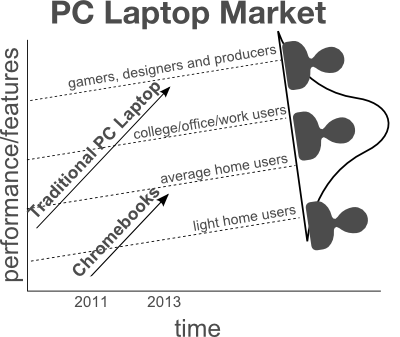 From the graph we can infer that Chromebooks have achieved a performance level (in addition to the lower price) that starts to fulfill most light home user needs and is encroaching on filling the needs of average home users – a large part of the overall market. However, in 2013 it’s still safe to say that Chromebook’s performance doesn’t quite achieve the level needed to meet the needs of college/office/work users. Also notice that the traditional PC laptop continues its steady march into over-designed (and expensive) territory – performance that only the most sophisticated customers such as gamers need from a laptop. If the model holds true (countless cases have shown this model to be predictive) then the future for Chromebooks is bright. Just extrapolating the graph alone shows that the next big market segment for Chromebooks to penetrate is the college/office/work users. 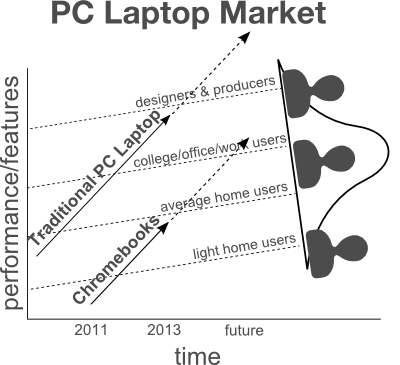 Once Chromebooks achieve performance sufficient for most college/office/work users, the traditional PC laptop will become a high-end niche product. That is unless Microsoft devises an effective response and pre-empts Chromebooks with something new of their own. Status quo – keep improving Windows by making Windows 9 an improved version of Windows 8 through a sustaining innovation strategy. Develop a disruptive innovation of their own – (note that Windows RT was an attempt to do this but has essentially flopped due to being a simple de-featured product rather than harnessing a disruptive enabler such as a new technology, business model or value chain). Given the launch of Windows RT, it’s important to note the difference between a disruptive innovation and merely a de-featured product. Windows RT was essentially a de-featured version of Windows 8 that could run on ARM-based chipsets. Had Windows RT leveraged a disruptive enabler such as a new technology, business model or value chain, it may have been more successful. These disruptive enablers are important because in order for a disruptive innovation to be truly disruptive, it must have sufficient runway ahead of it, so to speak, to eventually provide the value consumers demand. 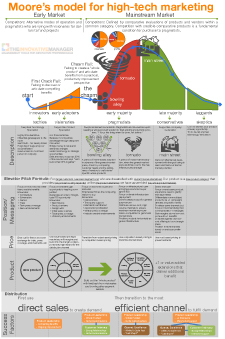 The difference is subtle, and not illustrated in the standard disruptive innovation curves, but important. 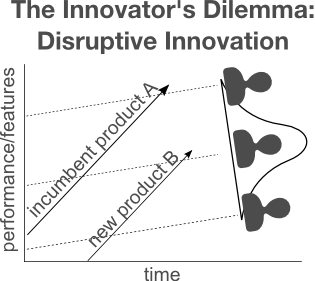 The graphic below illustrates these three enablers of disruptive innovation. For example, consider the difference between Windows RT and Chrome OS. Chrome OS, which runs on all Chromebooks, is disruptive because it leverages new technology – cloud computing and web-based applications – and has sufficient runway ahead to enable new and valuable experiences for consumers. Windows RT however, does not leverage the cloud or any other new technology and the only thing ahead on its runway is a full blown version of Windows 8. Many technology enthusiasts agree that as web applications mature and as cloud computing gains further traction, consumers will be exposed to new and valuable ways of interacting with their computer. Chrome OS already makes software updates seamless and automatic as opposed to the nagging that Windows does when it needs to update. Other benefits such as continuous saving and automatic document revision control are built in to many web applications including Google’s own Google Drive office software. My answer: Microsoft should develop and launch a Windows Cloud OS (the title can be whatever but I personally favor this). If Microsoft wants to remain relevant in a world of cloud computing, it needs to move further than just making Windows 7 touch-friendly (Windows 8). They need an answer to Google’s Chrome OS and the way to do it is to build a version of Windows that is essentially a browser that helps consumers use their SkyDrive and Office 365 products seamlessly as if they were running on the machines themselves. License this new Windows Cloud OS to OEM’s, such as Dell, for free to ensure the price of the overall computer can be competitive with Chromebooks and charge low monthly subscription fees to consumers to use advanced web applications such as Office 365. Microsoft doesn’t need to die and can save itself if it comes to the stark realization that the market is shifting quickly underneath their feet and unless they jump wholly onto the cloud computing bandwagon, they will be left behind. Meanwhile, the next time a friend in college asks me for advice on what computer they should buy, I’ll probably tell them to get a Chromebook! 3 Responses to "Why Chromebooks Are Disruptive Innovations And What Microsoft Should Do About It"
Great read. I especially enjoyed the wonderful display from my new (hp) Chromebook. My husband could be considered an early adopter, but the Chromebook was actually my idea and I’m pretty proud of it. We actually converted from Macbooks. We jumped on the apple band wagon before they’d even released a data phone. My husband does think his (acer) Chromebook would meet all his work needs. He did say he’d convert his files to PDFs before submitting them to the Court (he’s a Public Defender), but otherwise it is totally sufficient. Thanks Liz! If it weren’t for my company being on MS Outlook (Exchange) and the need to constantly create Excel and PowerPoint files, I would have already switched to a Chromebook. Whenever people ask me what type of PC they should get I always ask what they are using it for. If they are just going to be just using the web, I tell them to get a Chromebook. Not many have taken my advice but let me tell you, I have used a Chromebook since before they were massively available (I have a CR-48). These machine are something that Microsoft has no real answer for, Windows is just too bulky and cumbersome to handle just the web like what the Chromebooks offer. More and more things are moving to the web, Google is leveraging their knowledge base and ad business to push innovation to hardware. The Chromebooks are the first real step in this, and I think that as more OEMs partner to make Chromebooks the more innovation we will see.